This week I got to research and do some work on figuring out the best way to take a multipage tiff file and convert it to a PDF format. When I first started on this, I went immediately to iText as that was the only library I was familiar with. After getting a working example going, I checked out the license for the most current version of iText and realized that it cannot be used in any closed source applications without buying the license. This is what led me to begin searching for other Java PDF libraries. I came across Apache PDFBox and saw that it had the ability to add images to the PDF, and even had a class to add a TIFF. I gave the TIFF example a try and I got a complaint about unsupported compression. After pondering this for a while, I had the thought of reading in each page of the tiff as a BufferedImage and then placing each one into the PDF as a JPG. This actually requires 2 libraries. Here is a example class that can be run against a directory of tiff images. All tiff files in the directory will be converted over to PDF. The only complaint I have about this solution is that it is doubling the size of the tiff at the currently JPG quality level. I was impressed that when I first tried iText, the PDF actually ended up being slightly smaller than the tiff file I was converting. I am not sure if there is some other way the jpeg could be compressed, or if it is just the tiff compression being better than jpeg that is doing it. Please feel free to share your thoughts, or other solutions. Its really saved my hours. This was very helpful! 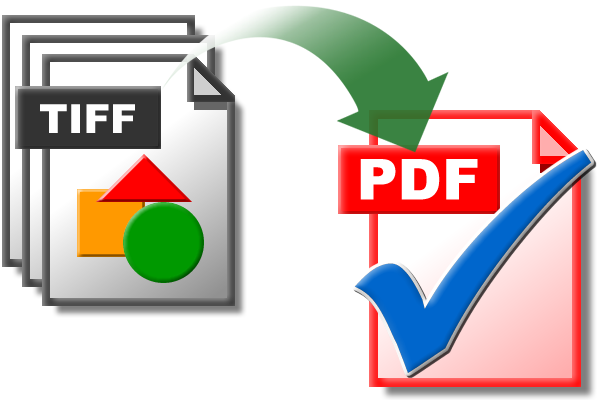 I appreciate both Paul and Frank who posted the PDFBox 2.0 version. It was a great boost to me. Thank you!